As I was watching the Google I/O keynote presentation, I thought about how all the development tools provided by Google (Google Gears, GData, OpenSocial, etc.) could be put to work to create a Google-powered Bank, and what the IT architecture of this Google Bank would look like. All user interaction devices, whether it is a teller workstation, mobile phone, ATM machine, kiosk would provide access to the bank via any of the standard Web browsers (Opera, IE, Firefox, Safari). Contacting customer support would be done via Google Talk click-to-call buttons. Interactive Voice Response systems would be powered by 1-800-GOOG-411 voice technology. All these user facing app would leverage a cloud of shared GData services based on Atom Publishing Protocol. These services would be used to retrieve and update any data and transaction: update accounts, customer profiles, schedule payments, withdraw money, consult account balances, etc. These services would be available to any developer who registered for an API key to create new 3rd party applications, with online documents, code examples, tutorials, videos, etc. There would be a related developer challenge that would award prizes ranging from $25K to $100K to motivate developers to create 3rd party applications. Google Bank would monitor usage and success via the API key, and acquire the apps that can contribute the most to their bottom line or user growth. OAuth would be used to allow 3rd party apps to accesss customer data without the user having to give away their Google login/password. OpenSocial would be leveraged by Google Bank to provide an easy framework for friends to share bills, family member to send money to one another via any device, and to loan money to friends/families or friends of friends. Google Bank would use this data to provide preferential loan rates or optimize transaction fees. Google Bank analytics would analyze my transaction patterns, build nice spending usage pie charts for me, and suggest relevant ways to save or make more money via competitive offers aggregated in Google Shopping. Bank marketing managers would use Google Bank analytics to analyze usage patterns, create marketing campaigns and target specific demographics and customer types in Google Adsense. And last but not least, users would be able to search all their personal data using a simple one input field user interface. To open source or not? or to do both? Open source as market segmentation tool. Several years ago, I found myself confronted with the decision of whether to open source or not the software of a company I co-founded. While I could find considerable literature on the strategic benefits of open-source freeware as an enabler modern version of the razor and blade strategy (giveaway the client or development tool or razor, sell the server or the runtime or the blades), our software was not lending itself very well to such a separation. My question was rather: if we have to choose between open sourcing blades and razors or nothing, what model would maximize our revenues, given our target market? By elaborating on the simple notion of “why giveaway something you can charge for”, I developed the chart below to help me discuss the decision with my colleagues. The idea is to not view open source as an all or nothing strategy, but rather as a marketing technique to segment your market and maximize revenue, except that in the open source case, the revenue is mostly intangible. According to traditional marketing segmentation strategies, customers with large budgets and who have a high perceived value of our software should be charged for it fully and get all the features and rights; and customers with small budgets and who have a lower perceived value of our software should be charged less for a slimmed-down version of the software. What’s new here is the category of users who don’t have large budgets themselves (the boss of their boss may have as it is the case of developers) but who see a lot of value in the software. These guys may not be able to sign a check, but they are able to bring more eyeballs to fix bugs, post feature requirements that are common to all users whether they have a checkbook or not, or simply spread the word about your software at the fraction of the cost and in a much better way than any PR firm. That’s not direct revenue, but certainly contribute to higher margins by reducing the costs of goods sold. 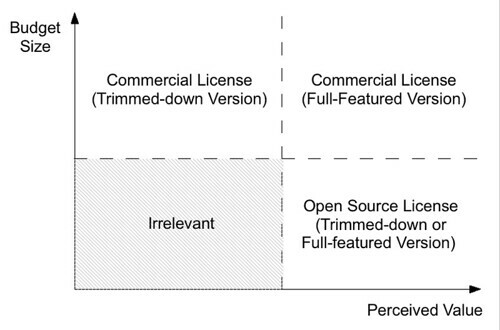 But if the distribution of customer types is such that a single model does not dominate, this model can actually be implemented using dual licensing, where one category of customers is segmented from another and charged differently, by offering both a commercial license and an open-source, usually GPL-like license. What’s even better is that customers are let to choose which category they belong to (actually their lawyers tell them). Designing the most widely adopted Web API for a particular functional domain does not merely take to offer the best and most specialized functionality at the best price, as reading Adam Smith would suggest. reducing his risks of using the Web API. Building upon what target developers already know. Depending on the target developer community, this may mean starting with a REST/WOA API or a SOAP/SOA API. Building upon what API users have already learnt so far about the API: learning one functionality should make the next one easier to learn. This includes using precise semantics and re-using them consistently, defining and sticking to naming and message structure conventions. A variety of one-to-many medias (wiki, archived mailing lists, chat channels, etc.) for user-generated support and documentation. Being very clear upfront about what the API does and does not and how it compares with others (to reduce the perceived risk that the developer will spend time on something only to discover down the road that it does not address his requirements). Ensuring the highest quality, up-time, availability and performance for the production version, and providing evidence of your commitment to these goals by using long betas (1-2 years) for new versions. Ensuring backward-compatibility: code written for the 1.0 should still work when the 3.0 version of the API is out. This means that your application should support 1.0 to 3.0 concurrently until no one uses 1.0 any more, and that versions should be explicit in URLs (ex. http://mycompany.com/webapi/1.0/…). Providing evidence that the Web API will be around for some time, because it is backed by a sound business model that can sustain its growth, maintenance and developments. An innovative business model (ex. SaaS) is not enough. Focusing on solving an urgent, valued, critical business problem first and using/combining known models that fits well the solution requirements is the key of any successful venture. For instance, some companies like SaaS ease-of-setup but they don’t like having their data in the cloud. Their need can be answered by combining SaaS model with the appliance model. I think this should be particularly seducing to the ultra-conservative financial services industry. Actual operations globalization and decentralization of improvements (“IT consumerism”) is a driving force behind new software investments. I wonder if that goes with corporate culture finally moving from a Stalinian management style to actually applying survival-of-the-fittest strategies to management, operations and innovation issues: instead of a management by committee where a handful of people that are not users are tasked with choosing a software product for the whole company, actual users can pick products from the Web for free, start to use them, integrate them with internal products, add new functions, have other easily build upon. In the end, the picked product(s) is the one that is most used and driving most user satisfaction and efficiency.